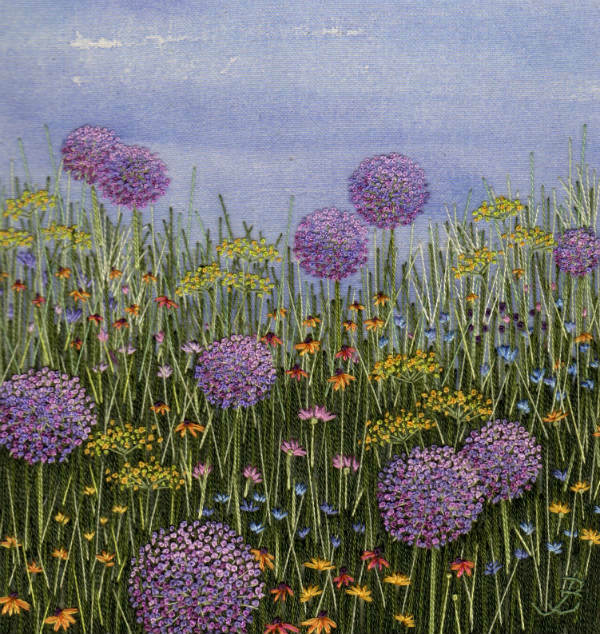 Jo creates original intricately embroidered artworks, inspired by classic English country gardens, the rural simplicity of wild flower meadows and her love of flowers. Jo’s interest in sewing began as a teenager, followed by a career in Fashion as a designer. With a relocation to Somerset, she now works full time at her craft exhibiting regularly in London, contributing to international embroidery magazines and teaching in Australia! The majority of her work is by hand on linens or her painted cotton backgrounds, she then layers the threads and silk ribbons to create the grasses, seed heads and flowers.